The Midwest Wife Carrying Championship course is about 100 yards long with a few obstacles along the way. REGISTER TODAY!!! – See the full Finn Fest schedule here. The amount of beer the winner receives is determined not by a scale but by putting beer on one end of a teeter totter and the “wife” on the other until it balances. The track has two dry obstacles and a water obstacle. The wife to be carried may be your own, the neighbor’s, or you may have found her further afield; she must, however, be over 17 years of age. The minimum weight of the wife to be carried is 49 kilograms (108 pounds). If she is less than 49 kg, the wife will be burdened with a rucksack containing additional weight such that the total load to be carried is no less than 49 kg. The only equipment allowed is a belt worn by the carrier, the carried must wear a helmet. The contestants run the race two at a time, so each heat is a contest in itself. Each contestant takes care of his/her safety and, if deemed necessary, insurance. The contestants have to pay attention to the instructions given by the organizers of the competition. Also the most entertaining couple, the best costume and the strongest carrier will be awarded a special prize. Ready to preregister? – tell us your name, your wife’s name, and your hometown. And start training! (from Wikipedia.com) Wife carrying (Finnish eukonkanto or sometimes akankanto, Estonian naisekandmine, Swedish kärringkånk), is a sport in which male competitors race while each carrying a female teammate. The objective is for the male to carry the female through a special obstacle track in the fastest time. The sport was first introduced at Sonkajärvi, Finland. 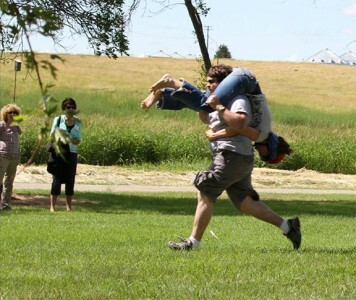 Several types of carry may be practised: piggyback, fireman’s carry (over the shoulder), or Estonian-style (the wife hangs upside-down with her legs around the husband’s shoulders, holding onto his waist). Major wife-carrying competitions are held in Sonkajärvi, Finland (where the prize depends on the wife’s weight in beer); Monona, Wisconsin; Minocqua, Wisconsin; and Marquette, Michigan. The North American Wife Carrying Championships take place every year on Columbus Day Weekend in October at Sunday River Ski Resort in Newry, Maine. The 8th Annual event took place on October 6, 2007, with 40 couples participating, an all-time high. Many North American Champions go on to compete in the Finnish World Championship. (from Wikipedia.com) The sport originated as a joke in Finland, supposedly reminiscent of a past in which men courted women by running to their village, picking them up, and carrying them off. The Wife Carrying Contest has very deep roots in Sonkajärvi’s local history, despite its humorous aspect. In the late 1800s a brigand called Rosvo-Ronkainen was staying in the area. He allegedly only accepted troops who proved their worth on a challenging track. The sport is now practised around the world and has a category in the Guinness Book of Records. (from the official wife-carrying event website in Sonkajarvi, Finland) Note from the editor: This is posted mostly for your amusement. You’ll notice some eccentricities in the following that can be attributed to language translation issues and quirky Finnish humor. 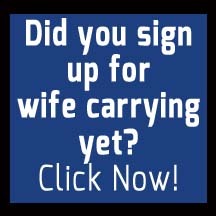 Y ou’ll find wife carrying enthusiasts in Savo, Helsinki, Central Europe, Australia, North and South America, in short all over the world. They are strong men and tenacious women. Most of these easy-going people seem to be characterised by placidity and happiness. Of course, with a few more serious looking devotees among them. Attitude The wife carrying is composed of humour and hard sport on a fifty-fifty basis. Everybody may choose what attitude to take towards the competition. The course is open for all to participate. Postures There are four customary styles to carry the wife: the traditional piggyback, the wife dangling upside down on the carrier’s back, thrown over on the shoulder and crosswise on the carrier’s shoulders. The style is free. You may also create a new personal style of your own. Outfit It is preferable to wear clothes which won’t be stripped off in full speed running and which are easy to hold on to. The carrier’s belt is the only equipment allowed to help in keeping one’s grasp. Some other tools known to be beneficial are a bunch of birch switches, swimming glasses and swimming slippers. Life The wife carrying is an attitude towards life. The wives and the wife carriers are not afraid of challenges or burdens. They push their way persistently forward, holding tightly, generally with a twinkle in the eyes. Eroticism You can sense the excitement in the air during the wife carrying competition. The core of the race is made of a woman, a man and their relationship. The wife carrying and eroticism have a lot in common. Intuitive understanding of the signals sent by the partner and becoming one with the partner are essential in both of them – sometimes also whipping. Wife According to the rules the minimum weight of the wife is 49 kilos. If it is less, the wife will be burdened with such a heavy rucksack that the total weight is 49 kilos. Generally the best wife is the wife of one’s own, all the more if she is harmonious, gentle and able to keep her balance while riding on the shoulders of her man. Track The traditional track for the wife carrying consists of sand, forested terrain, a water obstacle and two log hurdles. If your style is “the wife dangling upside down”, you have better to remember that in the water pool the wife’s head is likely to go under the water. Rhythm It is of great importance to find a mutual rhythm. I the wife on the man’s back is rocking out of time, the speed slows down. When the rhythm is good, the wife and the carrier become one accompanying the motions of each other. It is advisable to practise in order to find the mutual rhythm before the competition. Training It is possible to train for the wife carrying competition everywhere in the middle of the daily routines: in the bath, in the super market, in the playground or in the body building centre. 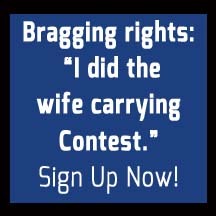 The wife carrying is good for your relationship.